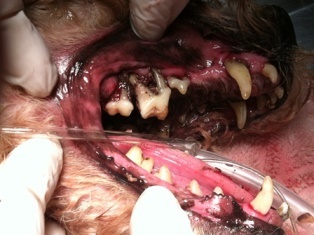 We often remind our clients of the necessity of regular dental care for their pets. Dental and oral disease is by far the number one problem experienced by our pets. More than 70% of dogs and cats have some form of periodontal disease (gum or tooth problems) that starts as early as three years of age. Smaller dogs and cats tend to have more dental disease than larger dogs. Exotic companion mammals such as rabbits, rats and guinea pigs may also require dental care. The biggest and most common reason that pets do not receive dental care they need is because pets rarely show obvious signs of pain or problems until extremely late stages of dental disease have set in. Our beloved pets feel dental pain and discomfort, but unfortunately they suffer in silence. A second reason pets often don’t receive the dental care they need is because their pet parents may fear putting them under anesthesia. In order to illustrate just what can happen to a pet when dental care is delayed, I’d like to introduce you to a dog recently adopted by a very proactive pet parent who recognized the need for immediate treatment. Our recent case was a dog adopted from a shelter. Little was known about his background. He was a stray that the shelter rescued off the street who was in a state of extreme neglect. He was only with the shelter a few of weeks before his new owner adopted him. 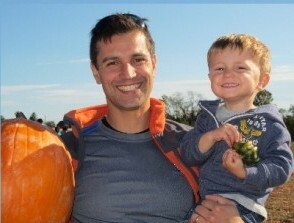 For the first few weeks, he was eating a soft diet. At night, or when he was resting, his pet parent began to suspect he was in pain only because his mouth would constantly be moving as if he were chewing something or feeling his teeth with his tongue (like a slight, constant grinding motion). He would also have a sad look on his face whenever he was at rest. She also noticed his breath was so bad that she could smell him from across the room. Bad breath is created by bacteria and infection. Upon my initial examination, I determined that the dog was between 9 and 11 years of age. Thankfully, the pet parent gave us permission to perform a complete dental examination. Initially, we found an enormous amount of tartar. 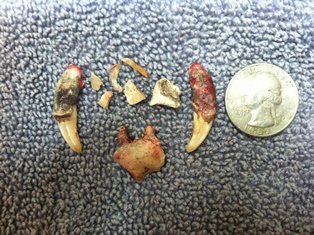 Once we safely sedated the dog and removed the tartar, we could see the significant number of diseased teeth ranging from Grade 1-4. Many teeth clean up great and can be saved. However Grade 4 teeth are no longer salvageable and surgically removing them protects the remaining teeth. The bacteria and infection fester under the gums on Grade 4 teeth and can eventually turn black. All of the bacteria under the gums which start as invisible liquid, calcifies, hardens and basically just sits on, infects and eats away at the root and bone on a living patient killing whatever it contacts slowly and silently. Look at the black disease growing down the root of these teeth. This is what people don’t see because they are not in the dental and surgery rooms with their pets. Most people would not let their own mouths ever get this way. We wish more people could know the truth about what is happening under their pet’s gum line. If their pets could talk, we know pet owners would want to help their pets with proactive dental care. We can all prevent Grade 4 dental disease once we get people over all the misinformation that’s floating out there. Our goal is to educate people about the safety of anesthesia if it’s done correctly. Pets receive many more benefits than risks from great proactive dental care. Veterinarians see dogs and cats with all stages of diseased mouths like these almost daily. However, pet owners because their beloved pet is still eating and acting normal might delay care. I wish pets could talk to their owners. Unfortunately, most people and vets aren’t psychics and we don’t have X-ray vision. That would certainly help us know the truth and encourage all of us to help pets sooner. The truth is we can’t see the real problem until all the teeth are probed, cleaned, and X-rayed under anesthesia. It’s a guessing game until you get in there. Some people are also so scared of the idea of anesthesia in their pets that they become paralyzed, procrastinate or just ignore the problem which just makes everything worse for everyone. The reality is the sooner and more often all the teeth are checked and cleaned, the safer and better it is for the patient. Dogs have 42 teeth. Cats and people have 32 teeth. We had to surgically extract 22 diseased teeth on this boy. 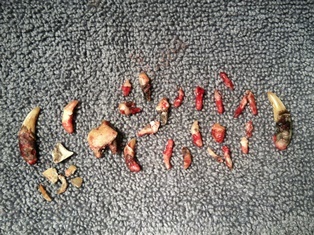 We cleaned the rest of the infection from this dog’s mouth to preserve the other 22 teeth. Cleaning properly under the gum line with an ultrasonic scaler and anesthesia allows bone to regenerate which reverses grade of disease significantly. This is a basic necessity for the pet’s health and well-being. This older dog did great under anesthesia and recovered smoothly. Yes, that is the normal and typical anesthetic recovery we have in a practice that performs over 500 dental procedures a year. This procedure is saving this dog from silent, daily suffering – saving his heart and organs from slow, quiet but deadly infection. Dental disease is reversible the sooner we get in there. These extraction procedures can require anywhere from 1-2.5 hours of anesthetic time when proactive dental care is delayed. Our goal is to minimize anesthetic time, but it faster to clean teeth than to remove teeth properly. Thank goodness we got to him in time. 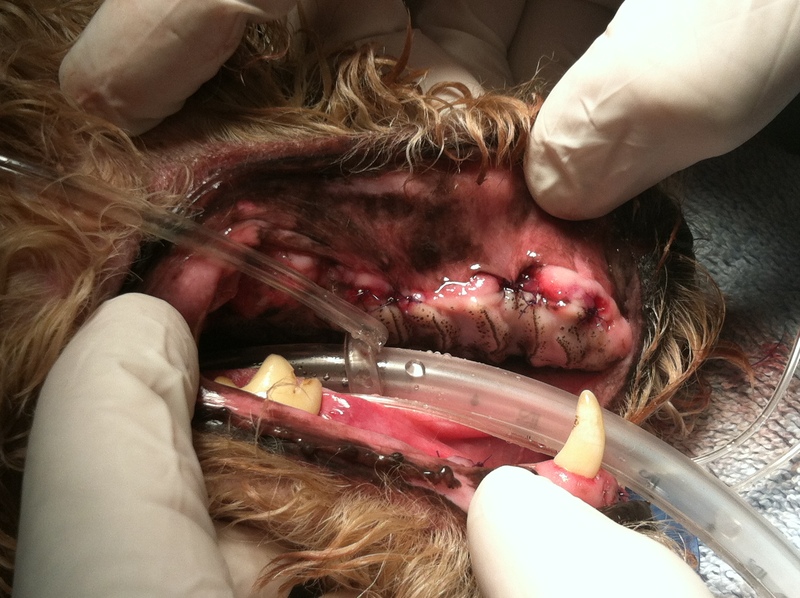 If this pet owner would have waited another 6 months to do a dental, he could have lost all his teeth or the infection from his mouth could have diseased his heart valves permanently. This is a photo of our good boy case study. This is a post-op after extracting his painful diseased teeth and suturing everything up. These cases like him usually start eating well the very first night. His rotting teeth were hurting with every bite. Now they are gone and so is the pain. The pet parent tells us now when her dog is resting, he is very content and he doesn’t grind his teeth anymore, nor does he have that sad face at night. He is more playful and is now happy 100% of the time. He is acting like a puppy again. He smells wonderful and she welcomes all the kisses from him she can get! 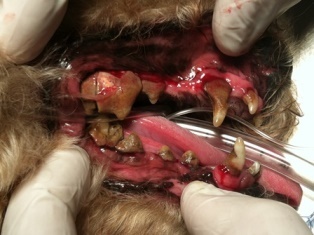 Regular dental check-ups will help insure this dog stays happy and comfortable for as long as possible. Dental cleanings reverse disease by 1-1.5 grades by removing tartar under the gum line so the bone can heal itself and grow back. Therefore stage 1, 2, and 3 teeth cleanings are quicker, safer and save the teeth. If people and veterinarians allow teeth to get to stage 4 by not doing prophylactic regular dentals, then there is a point of no return for the tooth and all the end stage organs it’s been silently killing. In addition, the risk of adverse effects by anesthesia is small. AAHA accredited hospitals like ours who have a proactive, highly skilled veterinary team that properly support their patients every time with an IV (intravenous) catheter, IV fluids, warmth, and continuous blood pressure (BP) monitoring will help insure that pet anesthesia can be just as safe as human anesthesia. Anesthesia – is it safe? Yes, it can be if all the safety protocols are in place. The safety questions you can ask of your veterinary team or hospital. This entry was posted in Exotics, General Pets, Veterinary Medicine, Veterinary Services and tagged Cats, Dogs, Exotics, Pet Dental Care, Veterinary Medicine. Bookmark the permalink.